I know you love crêpe!!! This is perfect for Christmas. Of course this cake is perfect for any other event! 5. Use a nonstick pan, or wipe the surface of the frying pan with a thin layer of cooking oil using a paper towel. Heat the pan on medium, pour half a ladle of the batter into the pan, slowly move the pan in a circular motion to spread the batter evenly. 2. Place 1 crêpe on a plate, spread some whipped cream, sprinkle with chopped strawberries, then place another crêpe on top. Repeat to complete. 3. 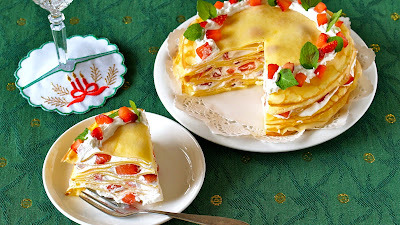 To finish, pipe out some whipped cream like a Christmas wreath, then decorate with chopped strawberries and mint leaves. ※ Place the cake in the fridge for a few hours ~ a day. The cream will set and you can cut the cake easily. Eat within the next day.